At the 2015 LA Auto Show Mercedes unwrapped its face lifted roadster with the blend of AMG, Mercedes-Benz SL63 AMG 2017. Just like its SL65 sibling, the model is equipped with better looks and sportive interior. 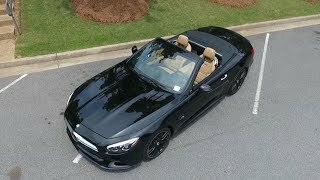 Let us have a look at the review of Mercedes Benz SL63 AMG 2017 to know in detail about it. I won’t say the interior of Mercedes Benz SL63 AMG 2017 went through entire overhaul but yes it did receive certain accents that make it look distinct and superior. Seating over those Nappa leather wrapped sports seats you’ll notice the three-spoke flat bottom steering wheel. The latter also comes wrapped in Nappa leather while the shift paddles feature Silver and aluminum work. Company also provides its buyers an option to get the steering wheel customized with DINAMICA inserts. The interior gets carbon fiber accents and has an IWC designed analogue clock giving it better looks. In all the interior details of Mercedes Benz SL63 AMG 2017 are definitely a lap ahead of the standard version and will undoubtedly give you the superior sportive touch. The exterior of Mercedes Benz SL63 AMG 2017 as you can expect from the AMG people. Starting with the front fascia it has a twin-blade design while the air vents and front splitter get the chrome trim work around making them look more highlighted. The front end looks more muscular with its redesigned hood and fenders. Moving towards the rear end you have updated side-skirts and 10-spoke light alloy wheels featuring titanium grey paint finished in gleam. The rear end is mounted with ‘beetle-red-taillights’ and newly designed rear diffuser. At the end of diffuser the model has twin-dual exhaust pipes. 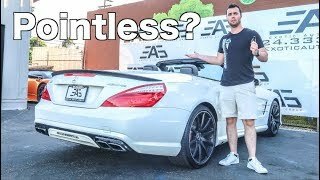 Thus rounding up the exterior details of Mercedes Benz SL63 AMG 2017 all I would say is, it looks remarkable with the new AMG accents and takes a lap ahead of the standard model. 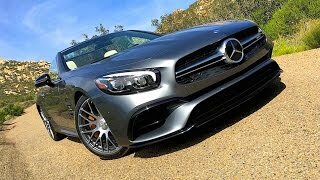 Beneath the hood of Mercedes Benz SL63 AMG 2017 is a 5.5 liter V8 Biturbo engine cranking total output of 577 hp and peak torque of 900 nm paired to the upgraded seven-speed dual clutch transmission. 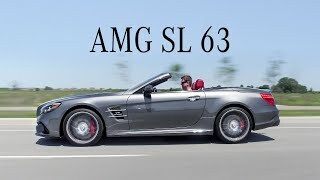 With this power rolling the wheels of model, the top speed of Mercedes Benz SL63 AMG 2017 touches the mark of 186 mph while the 0-60 mph sprint can be knocked in just 4.1 seconds.